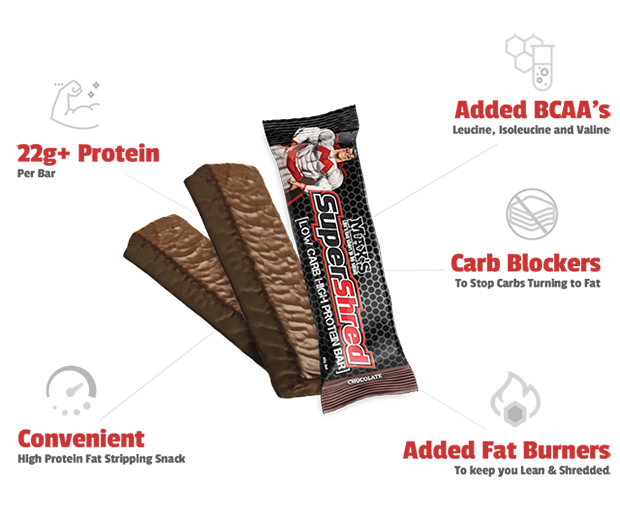 SuperShred Protein in a Bar! Maxs SuperShred Low Carb High Protein Bar is the ideal low carb/high protein snack or meal replacer. Hydroxy Citric Acid inhibits conversion of carbs to fat, Phaseolamin blocks carb digestion and powerful fat burners really fire up your metabolism. Max's Super Shred Bars are great to eat as part of a low carb diet or cutting up program to help you strip body fat and build lean muscle. Averages based on 25 total ratings. Awesome delivery time to rural South Australia. Great packaging and product. Not too bad. After taste is ok, unlike some protein bars. One of the best tasting bars I've ever had. a great mid-afternoon sweet snack. chocolate coconut is pretty tasty! taste great, and really great for hunger cravings, one of these fill me up no problem. Choc coconut is the best. Tropical cream is pretty good too. They taste awesome! great snack! Done a great job in keeping me full as a snack. Taste great and hold those cravings. Will buy again. Great taste and great nutritional value. What a great way to keep up the protein intake. I work odd hours and sometimes the only place to eat are the dreaded fast food shops. But HydoxyPhase Cut Carbs Bars allow me to maintain a healthy diet and substitute the junk for an easy to use bar. Tastes great. Just dont leave them in your bag in the heat, they melt very quickly. But still tasted good. These are the business. Taste epic, has all the good ingredients & will keep your metabolism kicking. Get the choc flavor, it's the best! It's the best tasting bar I've found yet and has great nutritional stats. The chocolate coconut flavour tastes great, as well as the tropical cream. Highly recommended, usual Max's quality and great taste, so you can't go wrong. Maxs HP+ Cut Carb Bars are AWESOME!! Choc-Coconut is fantastic! Great consistancy, not too chewy, not like a brick. Great stuff from Max's, definately getting on these again!! GREAT tasting product. Great for a snack, probably a bit expensive to have a lot of them, however; a great treat and a great product to keep in the cupboard for a snack. Will buy again. As usual, speedy postage from Mr. Supplement and good that we recieve your products deployed with the military. First off I am so impressed with the shipping, I live in Sydney and have been recieving my orders the same day they are sent. As far as taste goes. I'm a fussy eater and I have loved all the flavours with my favourite being caramel nougat. And the results have been wonderful I have used them as 2 meals whilst at work with super shred and have lost 15KG in 1 and a half months. I REALLY LOVE THESE BARS! I was looking for any easy, tasty and healthy bar for snack time at work and when I couldn't get to my protein drink. I really love the Max's Cut Carbs Bar, mainly due to the fact they taste great. Many bars are like eating a slated piece of cardboard, not these. These are really good not only the taste but the texture, they don't crumble all over your lap or require a pair of pliers to consume them. They are the complete bar encompassing taste, value for money and essential ingredients to assist training of any type. I have been taking Maxs Hydroxyphase + Cut Carbs Bars as a meal replacement. They are very tasty and work well they give me lots of energy and don’t leave me feeling hungry. Maxs Hydroxyphase + Cut Carbs Bars have helped me to lose fat but gain lean mussle. I have tried all flavours they are all great tasting however I do prefer caramel nougat more. I recently purchased a box of Max's choc fudge bars. As far as taste go they are delicious, I have tried all the flavours and I enjoyed them all very much. I have a healthy appetite and I found that these bars indeed satisfied my hunger. They are a perfect in- between meals snack choice or even as a meal themselves. They contain a good amount of protein and are not too heavy on calories either. I will continue to buy these bars as they are the best all round protein bar I have ever tried!! Two thumbs up! I have been using Max’s HP+ bars for some time now and I find them to be the perfect snack between meals. I have a protein shake in the morning and at night, but during that day when I’m on the go I find easier to just grab a bar. I have tried each of the flavours and love them all. I’ve now lost 10 kilos since my wedding last year. My wife is so impressed by my new shape she started using them to help lose extra weight from having a bay and she is looking fit and fabulous. I lead a pretty busy life so always like to have a stash of bars on hand just in case there’s a chance I may miss out on my requirement for protein to help me add lean muscle. I’m glad I grabbed some of Maxs HydroxyPhase+ Cut Carbs Bar with my last order form MrSupplement as it’s perfect for eating on the run AND tastes good… unlike some of the other bars out there. Thanks MrSupplement for another great product. I have tried most of the protein bars on the market and have found that Maxs HP+ Cut Carbs are the tastiest. They have the right amount of protein and carbs compared to many others. Tropical Cream is my personal favourite; I eat them as a convenient afternoon snack at work where time is limited. Also thanks for the quick deliveries. The first bite of the choc coconut protein bar is just delicious. It has been a while since I tried any other protein bar which does not sacrifice flavour for nutrition. Every single time I go shopping for my protein snacks, I hesitate on so many products given the awful history of their proposed "flavours". So when I set out to try this product, it was more for the body building benefits and the awesome flavour was definitely a treat. I am usually short on time for snacks during work and thus I find protein bars are the best way to go to keep that positive nitrogen balance and effective workout. Quite often, I miss out on the protein part when eating out as those tend to go big on the carbs to protein ratio. Thus this product has helped me to balance that out. I have never felt as satisfied with Maxs HydroxyPhase Cut Carbs Bar (especially Chocolate coconut flavour) compared to other brands. My girlfriend who is also a gym junkie loves this product and has it as a snack an hour before her intense workouts. I must say it definitely works for us in nutrition and satisfaction plus maintaining that lean and ripped body. Give this a go and you will definitely want another bite, good stuff ! Can I use this meal as a main meal replacement? Max's HydroxyPhase+ Cut Carbs Bar is a fairly low calorie bar and can be used as a main meal replacement in the short term, however, it is more ideal as a snack replacement throughout the day. Using it as a main meal replacement might make you feel hungry throughout the day. Max's Protein Blend (Whey Protein Isolate, Soy Protein Isolate, Whey Protein Concentrate, Calcium Caseinate), Chocolate (Maltitol, Full Cream Powder, Cocoa Butter, Cocoa Liquor, Lecithin, Flavour), Polydextrose, Glycerine, Inulin, Canola Oil, Glucose Syrup, Flavours, Fruitrim (Fruit Juice, Natural Grain Dextrins), Cocoa, Phaseolamin, Green Coffee Extract, L-Carnitine, Tapioca Starch, Sweeteners (955, 950). Consume 1-2 bars per day between meals or to replace meals. Max's bars should be taken in conjunction with a nutritious diet and a suitable exercise program.